An integrated program designed to incite action among policy makers by asking provoking questions around advances in sustainability, manufacturing, energy, mobility, and community. Digital: A custom ad module featured a series of interactive questions and provided real-time results upon interaction. 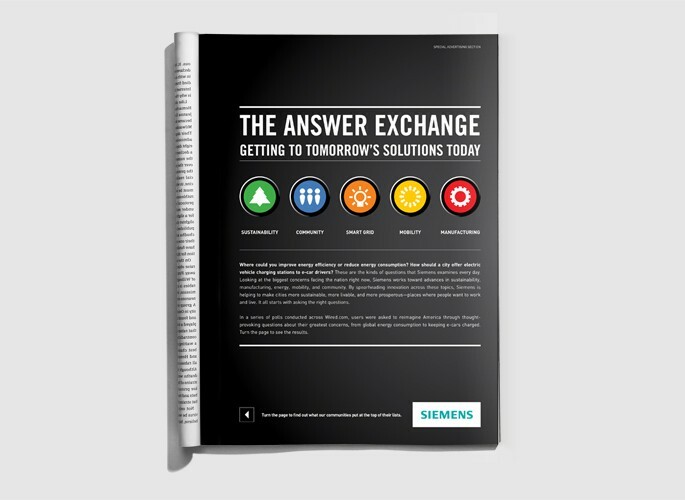 The unit incorporated a Siemens Resource Bar, highlighting Siemens’ solutions alongside relevant content from WIRED. Print: A high-impact gatefold featured data collected from the custom online polls. The dynamic execution generated good will for Siemens and spotlighted U.S.-built innovations. Tablet: A dedicated Twitter hashtag was integrated into Siemens’ custom tablet execution. The real-time Twitter feed pulled in select hashtags, including #Siemens.